Rendering of proposed Da Vinci Science City facility in downtown Easton. The Lehigh Valley took a big step forward Tuesday toward the development of a STEM-focused, state-of-the-art facility that city planners hope will drive educational tourism for decades to come. 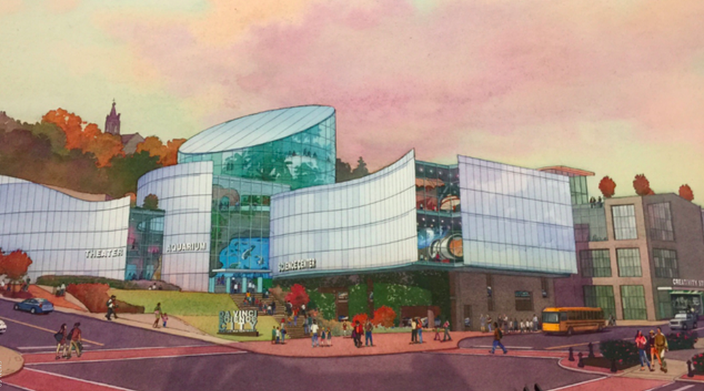 In a joint announcement, the city of Easton and the Da Vinci Science Center revealed a rendering of a multi-million dollar science center proposed in downtown Easton. Billed as Da Vinci Science City, the 175,000-square-foot facility's goal will be "to bring science to life and lives to science," according to a website backing the project. Envisioned as a regional hub and economic development opportunity, Da Vinci Science City has been in the works since September 2015, when trustees of the Allentown-based science center began considering an expansion locally, either in Bethlehem or Easton. 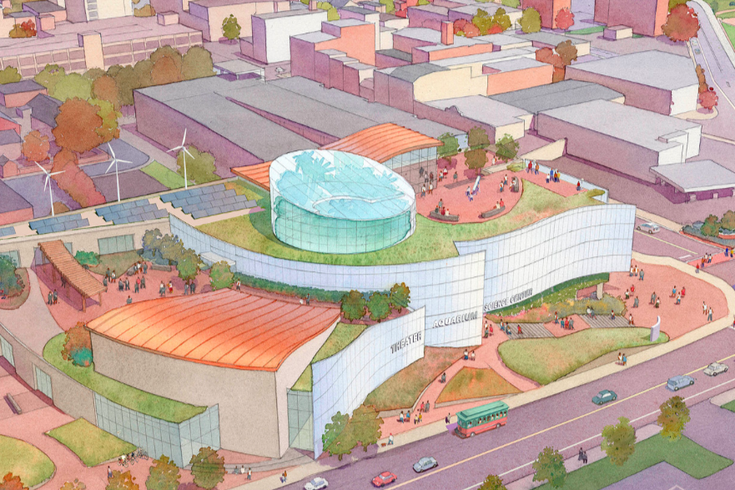 Easton ultimately prevailed late last year and pledged $30 million towards the project, including $6 million for the land and $24 million for construction and exhibits. Centerpieces of the proposed facility, designed by San Francisco-based architecture firm EHDD, would be a 500,000-gallon saltwater aquarium, an immersion theatre with virtual reality presentations and a creativity studio for project-based learning. Rendering of Da Vinci Science City. "Da Vinci Science City will utilize programmatic techniques that engage visitors in science, personalize the experience for each visitor, allow visitors to see themselves as STEM professionals, encourage them to consider careers in STEM and promote frequent repeat visitation," read a statement from the project website. Over the course of the next week, public forums will be held at various locations as part of an 18-month planning period. Construction at the site, currently occupied by a Days Inn on South Third Street, is targeted to begin in mid-2019 and wrap up for a grand opening in 2021. An ongoing feasibility study for Da Vinci Science City will continue through December as planners seek to secure an additional $100 million to finance the project. Those backing the development say the facility will attract 600,000 visitors annually with a direct economic impact of $45 million per year. From an educational standpoint, the goal of Da Vinci Science City is to develop more STEM professionals to meet demand and fill higher-earning positions in Pennsylvania.